Version 1.22 has been uploaded and should be available soon. This includes all of the terrain from U23. The devs also gave us a sneak peak at the area around the Beorning lands, but that is obviously all dev markup work and subject to change (but it does show that the devs are working on that area). The online Google map won't be updated for a while, I have to re-work a couple of the tools I used to make the map since they work great for creating the project from scratch (easy to do but quite time consuming) but doesn't handle partial updates (a little harder to do but far less time consuming for future updates) quite so well. Last edited by Garan : 02-01-2019 at 12:19 PM. I've been using this since I posted. Works great. I put a macro on my mouse for doing /loc so that I can update my current position whenever I want. I keep it open all the time and usually at 2x zoom out, but sometimes 4x for general without icons. The only issue I've noticed is that resizing the window is clunky when it's not on 1x zoom out level. Otherwise everything is smooth. Other than the new areas, the only regular map area it didn't show during my gameplay was the road/path area leading up to Thorin's Gate (the path that goes North-South). Sadly, the behavior with the window resizing is a byproduct of the client image handling with scaled images. 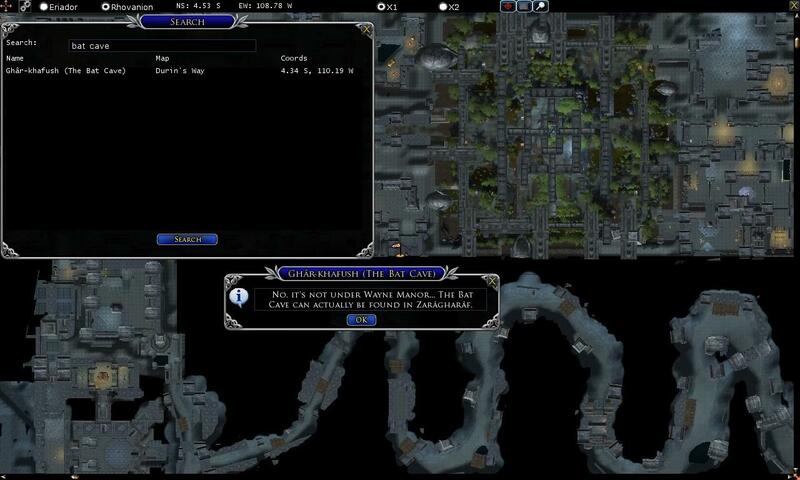 The pre-zoomed tiles help with it at zoom level 4 and 16. Using additional pre-zoomed tiles for zoom levels 2, 8 and 32 would help smooth it out more but would bloat the client tremendously (it's already a huge download) so the clunky resizing was my compromise for a smaller footprint. There will be some discrepancies between what you see in the radar map and TerrainMap because there are multiple versions of many of the terrains in the game. I tend to use the resource image with the highest ID when faced with near duplicates but that doesn't always represent the latest version of the area (sometimes the devs will rework an old area, such the tutorial areas which leads to resource IDs that are higher representing a version of the world that are older). 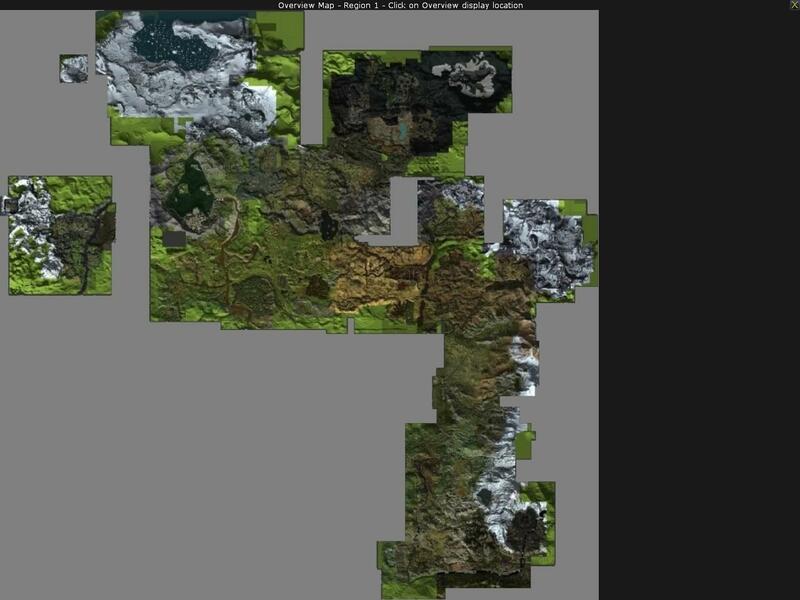 TerrainMap will always represent some version of the game world since the images are coming from the actual client, unlike the online google map which has static images that may not reflect updated terrain from a reworked area. Hope that explains the issues. Glad you enjoy the plugin. Last edited by Garan : 02-01-2019 at 12:12 PM. Last edited by cipher_nemo : 12-03-2018 at 01:07 PM. Garan, thank you so much for all of your hard work in creating and maintaining this! I'm coming back to LOTRO after many years, and this is absolutely invaluable to someone who missed a lot of expansions and updates. Kudos! You're Welcome. Truthfully, I've been a bit lazy (ok, not totally lazy, but otherwise occupied) and haven't included updates for U23 yet. IIRC when I left off, the map stuff was all complete, I just have to run around and grab the annotation data. Hopefully I'll find time to do it before the holidays set in, otherwise it will have to wait 'til after New Years. Anyway, glad you enjoy it. This is an outstanding job on your part! Thank you so much! I'm going to add the link to your map on my kin's page. I notice that you only use lower-scale tiles. Is this WIP, or is it a part of your agreement with SSG? By the way, I can give you some tiles of the old official dynamic map. Those are pretty rare, I had to do some (legal) magic to obtain them. Thanks. Not sure what you mean by 'lower-scale' tiles. The fully zoomed in tiles are the actual in-game assets for the game compass (200x200 pixel images, the same images used by TerrainMap). As you zoom out, a set of pre-zoomed tiles are used - that is how the Google Map API works. 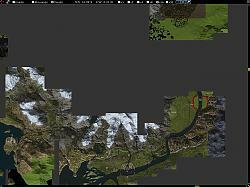 The old MyLotro map used the same Google Map API but the tiles were just pre-scaled to 256x256 pixels. The original tiles aren't actually rare, Turbine still has all of the tiles for their old google map as it was last displayed from MyLotro, it's just that most people don't know how to access them any more. As it happens, the 'classic' version (see link at top of plugin description above) is actually using those very tiles still hosted by Turbine (with permission). Last edited by Garan : 10-30-2018 at 08:45 PM. Did you know TerrainMap is also now a browser based google map? Last edited by ENDrain : 10-30-2018 at 01:16 PM. I download and installed the new V1.21 map and it now works fine. Last edited by Garan : 06-08-2018 at 08:29 PM. Parts of the map have grey blocks with a white lined grid pattern. I have reinstalled the 'GaranStuff' folder into the plugins folder but this did not help. I would attach a screenshot if I could. Can anyone help? The grey grid indicates missing images. 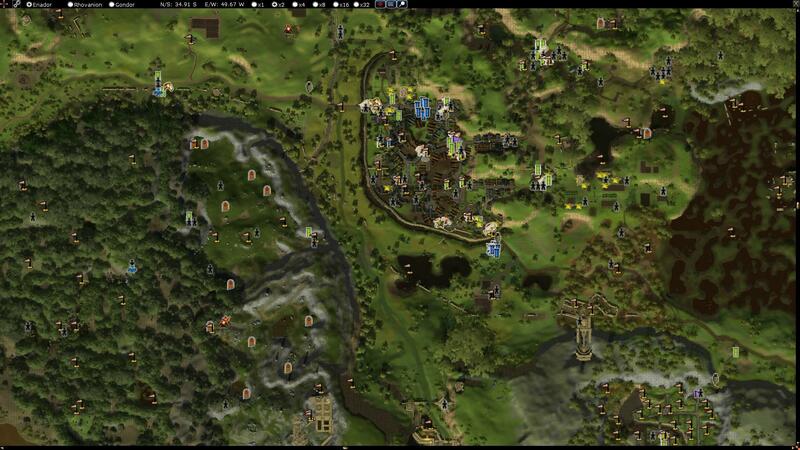 Are you using the latest update (TerrainMap was updated today for changes made in U22.2)? If so, what region are you displaying and roughly what area or is it happening in all regions/areas? It is a Herculean effort no doubt. And now Severlin is talking about . . .
A new interview was released by MMOCentral with Severlin that says U23 will be the Grey Mountains, which are to the north of Erebor and Mirkwood. It will possibly include Mount Gundabad, which in lore is a major orc stronghold, but was once an important Dwarven site. The mountains were also home to many dragons. It will come with some instances. You're welcome and thanks for the comment. 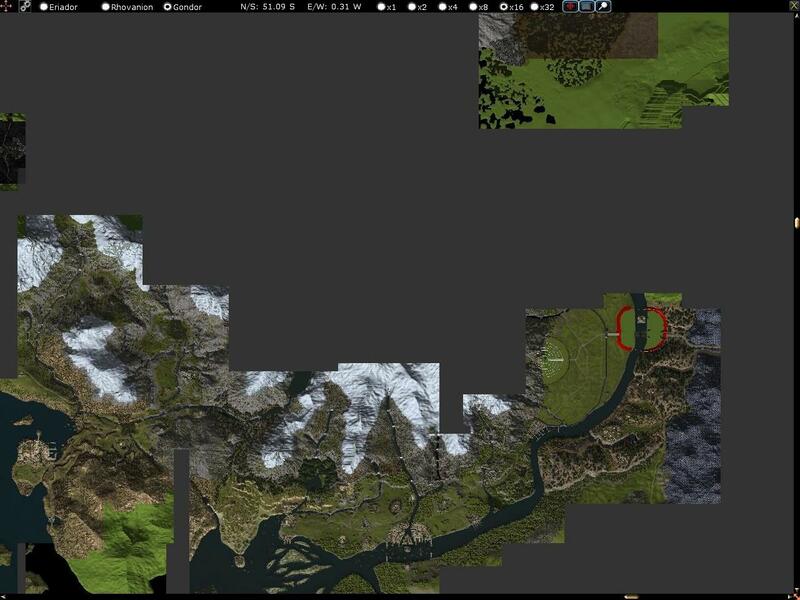 I read the interview a couple days ago, just after I finished cropping off the dead space north of Erebor . It has some interesting implications for TerrainMap especially depending on how far West they place Gundabad on the map (assuming they go that far) - the world is significantly compressed, so it's quite possible they would place Gundabad in Rhovanion due north of where they placed Zirak Zigil. Ver 1.20 has been uploaded. Ver 1.20 contains the new Northern Mirkwood area in Rhovanion as well as a few internal changes in preparation for some future functionality. If anyone sees anything odd in Rhovanion, particularly at zoom levels greater than 2, please report the issue. All of the pre-zoomed tiles had to be replaced as a result of the region being more compact (Erebor is now closer to southern mirkwood than it was when it was just an instance). I believe I eliminated all of the ghost images left by the shifting of the pre-zoomed tiles but if I missed anything, let me know. I apologize for the really, really late release of this update, I got sidetracked by a number of RL issues but better late than never. Last edited by Garan : 04-18-2018 at 08:57 PM. If you zoom out to X32, it appears that yu didplay two almost identical maps. ONe has a hole in the middle and one is filled in. Rhovanion is a weird region. Before U22 it consists of a large area starting with Lothlorien and Mirkwood, south through all of Rhohan plus a medium sized are that is Moria to the west of Lothlorien. It additionally has several small, disconnected areas that are Zirakzigil (just north of Moria), Beorn's cabin (north east of Zirakzigil) and finally the Dale area in the far north east from some of the instances. U22 fills in part of the area north of Mirkwood toward Dale - Beorn's cabin actually got moved slightly to make room for it. I'm still piecing together the forested areas of U22 - all those trees look the same! so it will be awhile yet.